When I first started getting into computer roleplaying games in the 90s/00s I remember playing the Infinity Engine games by Bioware and Black Isle, such as Baldur’s Gate 2, the original Fallout games, and of course Planescape: Torment. It was the quality of writing that drew me in and took me to another world, the graphics were just a background setting to that writing. Somewhere in the 2000s RPGs became more action orientated and prioritised mechanics and visual appeal and combat over branching stories. Nowadays a lot of popular RPGs are those such as Dark Souls, which seem more about combat and atmosphere than anything else. Blockbuster games such as Dragon Age: Inquisition and The Witcher 3 still show that great writing, characterisation and real player choices can still be popular. 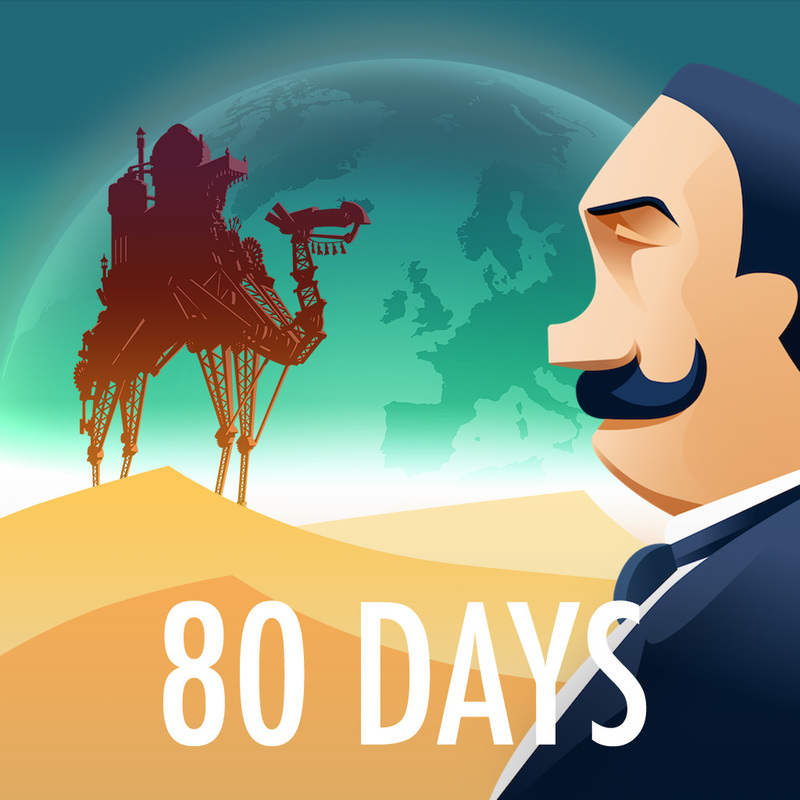 You are the butler of Philleas Fogg, the man Jules Verne writes about in ‘Around the World in 80 Days’. Your task is to choose how to get around the world not more than 80 days, as you plan routes between cities, buy and sell items and manage the finances of the trip. It really captures a sense of adventure in the world, and builds on Jules Verne’s steampunk theme as you encounter fantastical means of transport such as mechanical ostriches, airships and others. Every route is different and you can choose how the story unfolds by selecting different actions your character will take. The writing is the best I’ve ever seen in a mainstream game. In this game which also takes influence from Jules Verne, the city of London has fallen through the crust of the earth into hell, where there is a giant underwater cavern called the Underzee. You sail across this underground sea, exploring islands and immersing yourself in this Vernesque/Victorian/Lovecraftian setting. The writing again is amazing; it reads like poetry. Another outlandish game, this time set in the world of Monte Cook’s Numenera, the writer behind the Planescape world which Planescape: Torment was set in. It hasn’t fully been realised yet but this game in early access form is already weird and wonderful, and much more interesting to me than yet another copy of on the elves and dwarves Tolkien formulaic settings. 3 oscilators and noise generator in the top left, 4 VCAs and S&H and Ring Mod sections in the mid center, LFOs in the top right. Filters! I love filters. 3 large format filter modules, and a Triple Resonance Filter which consists of an additional 3 filters packed into one unit. A quantizer is also there which I currently don’t use much. Envelopes in the bottom left, Voltage Controlled Slew Generator and Make Noise’s Maths in the center left, center right is my trigger sequencer setup from LADIK, bottom right is attenuators and linear and exponential mixers. These functions are quite handy, and allow you to do things such as copy and paste errors and google for them without having to manually open a browser. You have to enclose arguments to both functions in single quotes, e.g. ‘chrome ‘http://www.google.co.uk&#8217; and google ‘one two three four’. You should add these to your config file at ~/.config/fish/config.fish and make sure Google Chrome is already installed. /usr/bin/open -a '/Applications/Google Chrome.app' "https://www.google.co.uk/search?q=$argv"
I use a heavily customised setup for vIM, the text editor that annoys me the least in ~30 years of using a computer. You can see my exact setup in my dotfiles repo on github, https://github.com/wordswords/-. ConqueTerm – Opens a shell window inside vIM, allowing you to have a REPL environment within vIM. NERDTree – A filetree plugin that you can see on the left of the window above. It replicates the Sublime text editor’s filetree. vim-airline – This is a statusline plugin for vIM that allows for a nicer status view for windows and buffers. vim-devicons – Allows for UTF-8 icons to make vIM editing slightly more graphical. Used by airline to display more info in less space, and by NERDTree to show filetype information. vim-fish – Syntax highlighting for fish shell script editing. vim-rails – Syntax highlighting and more for rails. vim-ruby – Syntax highlighting for Ruby. More adventures with Fish shell. I have scripted the generation of a bunch of test asset audio files in mp4 format suitable for dash streaming. I have used the audio file commandline tools ffmepg MP4Box and sox in this script, they are pretty powerful and worth installing via homebrew on OSX. Thoughts: I think that instead of quoting you can just output $variable, which is probably better coding style. I’m still working out good way to return variables from functions, it seems that you need to echo out the output and that gets picked up by the calling function, which is a bit messy. # move to the asset output directory..
ffmpeg -i "$input_filename" -ab "$bitrate"k "$output_filename"
sox -n --norm=-3 -b "$bitrate" "$wavfilename" synth 3 sine "$frequency"
A few months ago I switched across from Bash onto the Fish shell, on my main development machine. I can’t get enough of its fast autosuggestions and its sane scripting language. Compared to Bash it is very fun to use. echo "Workspace is $size MB"
if math "$size > 1000"
echo "Workspace too big to commit!" echo "Workspace is under 1GB, OK to commit"
git commit -m "Automated backup"
Each individual directory additionally usually has its own git config which is synced to the separate repos for the code I’m actually working on. But if my development machine is stolen or somehow destroyed, or I want to quickly replicate my environment on another machine with access to the original repos, then I can regenerate the associations between the different directories. It also makes me mindful of not committing images or other video assets. ADAT with Digi 002 Consoles – Don’t throw them away just yet! A fairly old style digital audio interface and mixer, which was all the rage back in 2002 when it first came out, but now is often found sitting in the skip. Why? Because it is a Pro-Tools inteface, and Avid stopped supporting it about 5 years ago, so it won’t actually work under Pro Tools and Windows 10 (believe me, I’ve tried!). It only works as a recording interface through Pro Tools, so you can’t just connect it via firewire to your PC and expect it to work. It does have a stand-alone mode though, which allows you to use it as an analogue mixer, and that is pretty useful in itself if you want to drive monitors or record things from the master out. However after digging around on internet forums for a while, I figured out a way of actually using it as a recording interface! This is through use of the ADAT output, allowing you to plug it into a ADAT capable soundcard and record seperate channels over optical. Caveats: it has to be 44.1khz sample rate, and you still have to use the Digi 002’s analogue to digital coverters in the chain, which are pretty old now! If you’re willing to live with this, and I was considering what the console cost me, you get an extra 8 audio input channels in your soundcard! Well worth the effort I’d say. To set it up with my Focusrite Sapphire 24 Pro, I followed the following advice from the Focusrite forum. This should work on most of the Sapphire range of soudcards. I thought it might be of some interest to describe how I use my Eurorack, at lot of the time, in making tracks. I have a 3 oscilator – 3 VCA – 3 filter Eurorack which I use primarily so that the oscilators initially work in unison mode with some slight detuning. I typically use a single loop, arpeggio or pattern that I repeat over the song. Then, partway through a track, I will transpose the octaves of the oscilators and vary the sustain of the envelopes, along with the filters and pulse-width modulation amount, to make a morphing yet harmonious sound texture progression. Here is my Doepfer Eurorack, which has 2 oscilators, the third is provided by a Doepfer Dark Energy MK1 semi-modular synthesiser that is wired into the Eurorack. At the start of 2015, I wrote down some goals for 2015. Around half-way through the year, I revisited these goals with some thoughts on how well I’d done. Now 2015 is over, I want to reflect on what has been achieved and what hasn’t. I also want to comment on the fact that I am discussing personal things here. A few years ago I was decided that I was going to keep this blog professional and pretty much dry of any thoughts or feelings on my personal life. I have moved away from that though, inspired by blogs such as Iain’s, where personal thoughts and feelings are mixed with technical observations. I would like to think that this isn’t a bad move; after all if potential employers come to look at this 5 years from now, and don’t like what I’ve done here, then I probably don’t want to work for them anyway. There is the argument that blogs should be ‘themed’ or targetted towards a particular subject to garner followers, and that too much sharing is possibly a bad thing. However, my current thoughts are that dry techncial info is boring, and I’d rather mix it with other things that are important to me. With that said.. 2015 was an eventful year, some things were awesome, some not. My mum started treatment for cancer, which is a non-curable kind, Myeloma. The treatment was a success and she is currently in remission for the time being, so that is a good thing, but how long she will stay in remission we do not know. Both my remaining grandparents also sadly passed away. I also split up with my girlfriend of 5 years, which was difficult and still haunts me to a certain degree. The money that my parents were going to put towards the wedding of the ex-girlfriend, they gave to me so I could put a deposit down on a house. So in August I bought and moved into a house in Withington, which I am in the process of doing up. It is *incredibly* cheap to buy in Manchester compared to the south-east of England, where I’m originally from, where the dream of having my own 3 bed, semi-detached house would not be possible in any area with a reasonable number of IT jobs in short distance. I don’t drive, so the fact that the tram stop is 10 minutes walk away is great for getting to work. I met my current girlfriend, Conny in May, and things seem to be going very well; she is even planning to move from Berlin to Manchester to live with me. This is obviously great, and I don’t know where I would be without her support. With all these things happening in my personal life, work took a secondary focus as I got things sorted. It also made me rethink what I wanted from my career. At the start of 2015 I had a new role, as Test Manager; the first level of technical management in my area at the BBC, and a big career move for me. Although I liked some aspects of the management role, I missed the technical challenges that had pretty much characterised the last 10 years of my career. There was not much direct coding, and I felt I was in danger of losing that aspect of my work. I took a 6 month attachment to R&D, which had me working in an extremely challenging technical role, on a HTML5 360 VR engine. In April when this attachment ends, I am looking to continue in a technical role of some description, and not return to pure management, at least for the meantime. Goals of 2015 – How Did I Do? Pushing for a place to be opened up in Platform Test to employ someone from the Extend Scheme – This was achieved, and Ben has joined the BBC on an Extend placement. Get better at music production – This has been achieved. I worked with my friend Gio, who taught me quite a few tricks about Ableton. I have released a 3-track EP called ‘Planetary Orbital’ on Bandcamp. I am also helping to organise a Music Production Meetup.com in Manchester. Getting married – Nope. Maybe later. Making friends with more people that share the same interests – Partly achieved. The Meetup groups will help this. I have also helped start a ‘Virtual Reality Manchester’ Meetup group, for VR fans in Manchester, the first meetup is next month. Saving more over the course of the year – Partly achieved. I have bought a house, so now I am in a quite a bit of debt, but the money I will be putting towards my mortgage will be money I am effectively ‘saving’ because it will be put into the value of the house. Joining a pension scheme – Achieved. Adopt a regular form of keeping fit – Partly achieved. I have now setup a return commute which involves walking past a gym that I’m a member of, so it is quite easy to go in there for 30 mins on the treadmill 2-3 times a week. I’ve just got to maintain the discipline.